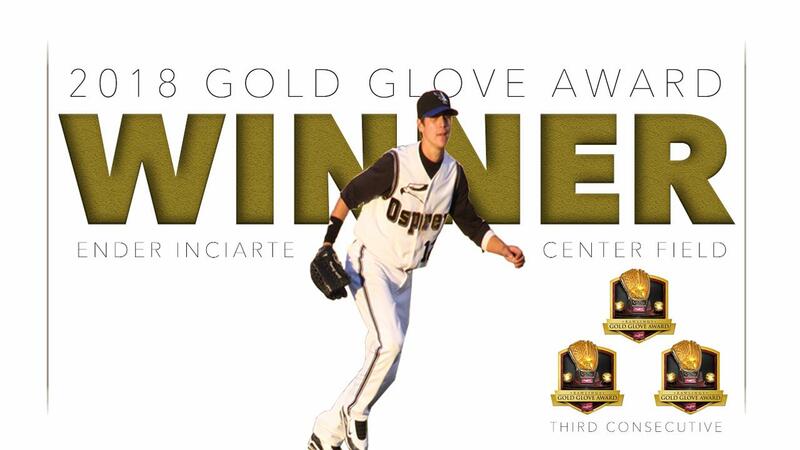 Outfielder Ender Inciarte (Atlanta Braves) of the 2009 Missoula Osprey was awarded with a Gold Glove as the National League's top defensive Center Fielder on Sunday. Inciarte was tabbed among the elite defenders in the National League for the third consecutive season (2016, 2017). The Rawlings Gold Glove is the award given annually to the Major League Baseball players judged to have exhibited superior individual fielding performances at each position in both the National and American League as voted by the managers and coaches in each league. Inciarte, who has developed a reputation around Major League Baseball, lived up to his name by ending numerous bids for a hit with spectacular catches. He finished ranked among the top three in the Majors in 6 advanced defensive metric categories; Putouts as OF - 380 (1st), Double Plays Turned as OF - 3 (1st), Range Factor/9inn as CF - 2.76 (1st), Total Zone Runs as CF - 11 (3rd), Defensive Runs Saved as CF - 17 (2nd) and 21 outs above average (1st). Ender committed just five errors in 155 games and produced a .987 fielding percentage. In just his fifth major league season, Inciarte provided the grit and fire that helped lead the 2018 Atlanta Braves to their first NL East Division title since 2013.